GDP Growth at 5.7% – Is Indian economy approaching doomsday? 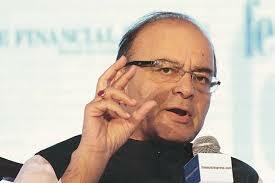 The protagonist, Arun Jaitley says, “It throws up a challenge for the economy. In coming quarters we require—both in terms of policy and investments—to work more to improve upon this figure”. Chief Economists of banks, Arundhadhi Bhattacharya and may people who are ought to be taken seriously are of the opinion this points towards a fundamental loss of momentum and cannot be viewed as transitory slow down due to disruptions. Given this scenario, GDP Growth or lack of it became a rallying point for disgruntled intelligentsia and middle class. Disgruntled due to lack of visibility in DeMo, GST implementation fiasco etc, GDP Growth rate is an armour for Modi bashing. Facebook and Whatsapp gyan providers are having a field day. For a change, bhakths are in the back foot. Not to be out done everyone I know of – friends, acquaintances, clients, my uncle who was dead and gone before Modi came to power – are worried about Indian economy and GDP growth rate. All through this, there is no one who has anything constructive to offer. How to reverse the trend, if at all? That’s Arun Jaitley’s problem and Modi’s waterloo. Everyone is unanimous about one thing. Multiple disruptions of headstrong Modi Government have put the country backwards, though we don’t care how to take it forward! Let’s have a saner approach and look at it holistically. First the disruptions. During the time of demonetization, we published a blog here. We hoped that following would be the benefits of demonetization. It’s more than nine months. Let’s take stock. Corruption – if some follow up actions are taken – can be substantially reduced if not eliminated – At lower levels, corruption is as it is. There are unsubstantiated charges of rampant corruption in states like Tamil Nadu. People say price for governmental contracts is upwards of 20% in illegal gratis. Indian psyche of disregard to rule of law will change for good. – Hope so. Except for increase in number of assesses, nothing else is visible. With terror finance crippled, Defence and Police will firmly act against terrorists and unlawful elements. – Nothing significant is visible. Unorganised financiers and loan sharks already have a real tough time. This has made life of many small debt laden businessmen easy. – They are back in business. Sheer amount of financial intelligence collected through big data analytics may well be worth all the pains. Imagine a situation where Government has absolute insight of financial behavioural pattern of drug peddlers, divisive anti nationals, criminals, gangsters, thugs and local political dadas. Government may well be collecting CC TV footage from known corridors of economic offence. – This is one is for real. Government is armed with data. Usual black money generators are worried lot and we hear lot of hair brain schemes to stash wads of notes. They are worried Rs.2000 notes will also be demonetised. This is good. But people want to see some big fish going to jail. 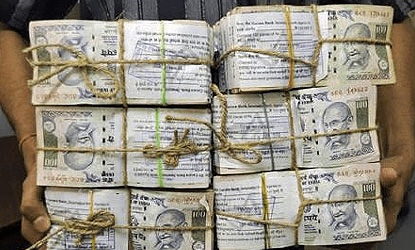 Not Jan Dhan account holders getting tax notices. All told, DeMo is not a great success, as on date. Unless the government collects at least Rs.1,00,000 crores in taxes from spurious deposits, it can be termed as utter failure. If it fails, it would be a poor way to repay the faith reposed by masses on Modi and the sufferings they have undergone for a better India. One wonders why the DeMo implementation is that terribly botched up. Is corrupt Babus implementing schemes for clean governance is the reason? Modi government needs to introspect. All told, there is definitive impact in GDP Growth rate due to demonetisation, largely due to the sufferings of SME sector. Afterword: I wrote this far and left it to be continued later. Times Now today came out with an exposé. Single company has 2000+ bank account opened by Bank of Baroda and exchanged Rs.4500+ Cr during DeMo period. 200000 shell companies were closed. Once banks provide more data, tax collection may well be over Rs.1,00,000 Crs. But it will take years to do that. This government has taken botched up implementation to an art form. There are hardware problems, software problems, E-Way bill implementation problems, properly structured tax rate is a problem, goods and services classification is a problem. Everything around implementation is a problem. We can’t help wondering if Babus are indirectly not co-operating with the implementation. One wonders why no heads are rolling when there is this much of inefficiency in implementing a watershed legislation. Implementation apart, there are a few real problems especially for SMEs. Making the companies GST compliant require professional help. It is not available in abundance. Shift from origin based taxation to destination based taxation requires mass scale reskilling of staff. Country doesn’t have sufficient reskilling infrastructure and SMEs do not have the wherewithal to afford expensive training for staff. Manufacturers did not have excise duty up to Rs.1.50 in the old regime. Now SMEs with turnover of Rs. 20 lacs are forced to register. GST puts pressure on working capital. Reverse charge mechanism and mismatch between input tax credit and output tax (Input is at 28% or 18% while output is at 5% or 12%). Already cash starved SME finds it difficult to take it. Various industries have come out with various problems. All these have natural impact on GDP growth. Despite all these, GST will have beneficial impact on the economy in the long run. Tax rates will eventually converge to 12% and 18%. Black money generation through business will be largely reduced. Economic buoyancy and tax collection will improve. Today, some positive steps are taken in the right direction and much needed time is given for proper transition. GST Council is a truly federal body. They are equipped take decision and virtually every decision is on consensus. They even write their own law. Erstwhile planning commission or even NITI Aayog are Centre driven bodies and they are not truly federal. This is one important takeaway of GST. We have become a truly federal republic. Some of the positive steps undertaken by GST Council today (6th October’2017). Tax reduced to 5% from 12% on cloths. Now traders don’t have to cheat government by invoicing salwar separate, kameez separate and dupatta separate. Earlier apparels less than Rs.500 attracted lower tax. 27 items tax reduced to 5% from 12%. Yet to see the list and analyse. Quite a few of them will release working capital release by reverse tax structure between input and output taxes. Restaurant Tax reduced to 12% from 18% GST. Turnover for composition scheme raised from ₹75 Lakhs to₹ 1 crores. Great relief for SME. They have to register beyond Rs.20 lacs, though. Compsite tax should be allowed as tax credit. 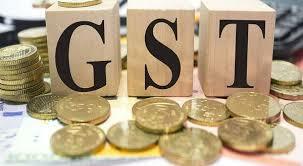 Major corporations insist their SME suppliers should register for full GST. E-way bill provisions deferred till April 2018. Government gave itself the necessary time to cover the implementation inefficiency. Still, it is good. Reverse charge to be abolished till 31.03.2018. Great relief on working capital. PAN card will not be needed for jewellery purchases above Rs 50,000. What for? How is it combating black trade? SMEs are proverbial backbones of Indian economy. DeMo and GST has made huge impact on this sector that has been great generators of employment. They need finance. Stung by NPA, banks are not willing to lend. CGTMSE Scheme (Collateral free loan for MSME up to Rs.100 lakhs) is just on paper. During the period of demonetisation, we made another blog post which is available here. We were hoping government will take some actions in the following lines. Nine months after demonetisation, not even lip service is being given. 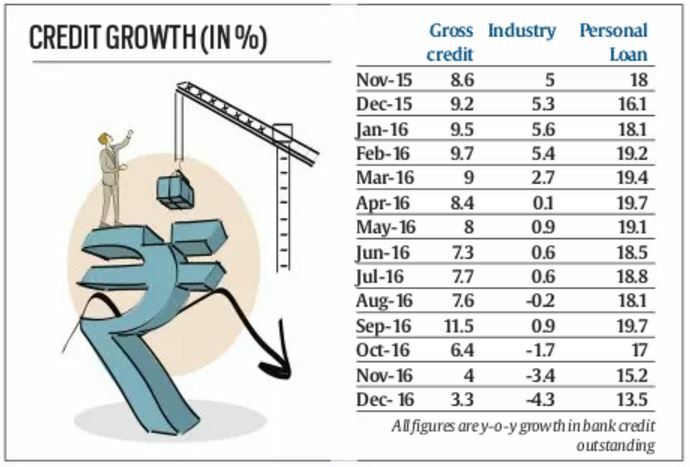 SME predicament has definitely affected GDP growth. Big industry credit off take is also pathetic. NPA stung Bank Managers are concerned with CVC, CBI and their own pension. With the result, banks are not taking decisions to take haircuts on NPA and move on. They want to fund only companies with credit rating of A+ and these companies are not investing. Those who need loans are not getting because they are not A+. This has resulted in poor credit off take and fillip to growth. One of our clients is a BBB- NBFC who lends to SME and provide Gold loans. They are finding it difficult to raise funds purely on rating count. Is our economy on a tailspin? Despite all these problems, we don’t believe, our economy is in ICU. Asian Development Bank has made identical downgrade on 25th Sep, 2017. “The Asian Development Bank (ADB) has slashed India’s GDP growth forecast for the current fiscal to 7 per cent from 7.4 per cent owing to weakness in private consumption, manufacturing output and business investment.” quotes Economic times dated 26th September,2017. Most other agencies have given similar ratings. 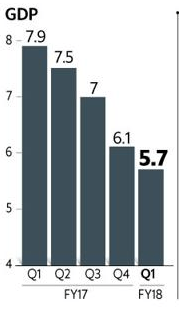 Suffice it is to say, world expects a GDP growth of 7% for FY18 for India despite 5.7% growth in the first quarter. Funny, not many stopped to think what it means. What it really means is the country has to grow at an average of little over 7.4% for the balance three quarters. If we place this in arithmetic progression GDP growth rate will be 6.6% in Q2, 7.4% in Q3 and 8.2% in Q4. Does it sound anywhere like an economy in death bed? I asked a friend of mine who works in a senior position for a piston manufacturer whether their production has come down. He said, they have huge backlog of orders. Auto is a bell weather industry and Maruti grew over 10% in September 2017, compared to September 2016. Similar figures for July was 20.6% and August was 23.8% Not just Maruti, entire industry grew. However, manufacturing SMEs need some serious help. DeMo and GST have put them in the backfoot. Serious remedies are being done with respect to GST. Funding aspect needs to be alleviated. However, Indian SME, like our society, is very resilient. That’s why you see every SME in your neighbourhood flourishing. Outlook of manufacturing is positive and agriculture is likely to buoyant. ADB, in the same report observed, “Despite the short-term hiccups as firms adapt to the national GST, we believe that continued reform progress will help India remain one of the world’s most dynamic emerging economies. It further observed, “Investment growth, however, is likely to remain muted in 2017-18 as budgetary constraints limit government expenditure. Growth will further pick up in 2018-19 as the new tax regime improves domestic competitiveness and government efforts to improve health of the banking sector aid private investment to yield results.”. That’s it, really. DeMo is not the kind of failure, world is perceiving it to be. It will indeed collect huge amount of taxes in the foreseeable future, if not in the near future. Process for settling down with GST has firmly begun. This will increase tax collection. Agriculture is likely to provide huge bonanza. These are definite pluses. NDA Government has already crossed 92% of its budgetary deficit for FY18. This means they have already front ended all planned investments. There is no further scope for additional investment. And credit off take is bad. SMEs require more help. Since income growth is not exponential, the government should curtail unplanned expenditure. Banks should be empowered to take haircuts and move on. We can find money for all these. Our debt profile is pretty good at 71% of GDP. Sovereign rating worry might prevent the government from doing this. In sum and substance, we don’t believe GDP growth is in ICU. We are stronger than that and we are likely to grow much faster than this. We would love your comments and interactions.